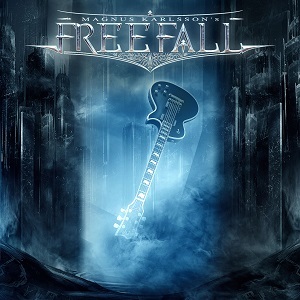 Free Fall is the first full-length studio album by Swedish heavy metal songwriter, guitarist, multi-instrumentalist and producer Magnus Karlsson. What is amazing about this release is that the album features nine lead singers, on paper this should not work, mainly due to the vast difference in style and range each singer has, however you we are dealing with Magnus Karlsson here, and he makes it work. He wrote each track with a specific vocalist in mind, and then set to work, the result is impressive, very impressive in fact. Take the opening track,” Free Fall” sung by Russell Allen, this is a huge song in every way, the guitar work by Magnus is outstanding and Russell Allen’s vocals are flawless, the track simply powers along. Tracks like “Higher”, “Not My Saviour”, “Ready or Not”, “Last Tribe”, “Fighting” and “Dreamers and Hunters” are all killers here, Magnus displays an unnerving knack of writing superb songs for vastly different singers, one after the other. Magnus’s guitar playing fits every song, with a solo to match, he knows he can play, we know he can play, so he leaves the excessive soloing out, and lets the rest of the music do the talking, something that Jorn‘s “Traveller”, as good as it was, was guilty of in the first degree. There are a few curveball tracks on here, “Stronger” is more of a pop rock track, certainly different, with Magnus showing us another side to his songwriting skills, and “Us Against The World” sung by Pink Cream69’s David Readman is an AOR fans delight. Karlsson handles vocals on three tracks “Ready or Not”, “Heading Out” and “On Fire”, while he’s not the most powerful singer on this opus, he more than holds his own, especially on the acoustic laden final track “On Fire”. The production is clearly aimed at showing off Karlsson’s killer riffs and dynamic melodic soloing. Free Fall is melodic hard rock at its best. His guitar work is simply amazing, It rocks, it soars with passion and emotion and then it rocks again. This is one hell of an album, and quite frankly, you should buy it. MIKE ANDERSSON (CLOUDSCAPE / FULLFORCE / SILENT MEMORIAL ).